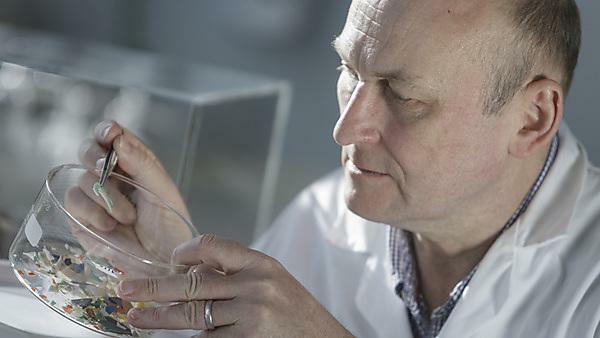 It has been quite a year for Professor Richard Thompson, marine biologist, and the man whose research over the last decade has put microplastics pollution on the global map. There was the summons to provide evidence to the Environment Select Committee in the summer, which put the topic of microplastic in the environment placed under a ministerial microscope. Then in the autumn there followed numerous national and international media calls in the wake of the government’s announcement that it would pass legislation to ban the use of ‘microbeads’ in cosmetics. And if that wasn’t examination enough, October found Richard playing a starring role of a very different kind, in CBBC’s flagship career discovery programme All Over The Workplace. In truth, it has been quite a remarkable number of years for Richard. Ever since he and research colleagues published a landmark paper in Science in 2004, in which they first coined the term ‘microplastics’, he has been at the forefront of a huge scientific, ecological and socioeconomic push to do something about the problem of plastic waste in the environment. The summons to the select committee was Richard’s third appearance in such a forum. Communicating the outcomes of his team’s research to policy has become an increasingly important aspect of his work, not just in the UK, but globally. From addressing John Kerry, the then US Secretary of State, to the climate bodies of both the UN and the EU, his expertise and knowledge is in high demand in the policy arena. The government made the announcement in October 2016 that it would be introducing legislation to ban microbeads, which are commonly used in products such as facial scrubs and shower gels. It is one of many product areas that Richard has been testing, with recent work expanding to synthetic fibres released from textiles during laundering. This research led by PhD student Imogen Napper showed that hundreds of thousands of plastic fibres could enter the water column with each washing load. Everyday cosmetic and cleaning products contain huge quantities of plastic particles, which can be released into the environment. The International Marine Litter Research Unit explains why the UK ban on plastic microbeads is important. As well as the scientific advances, Richard has done a huge amount of work with the media in recent years, and has contributed to documentaries and books. And he can vividly recall the moment in 2004, when a research ‘side line’ that had been in his words “he had been steadily chipping away at” via undergraduate and postgrad student projects suddenly ignited through first a Leverhulme Trust grant, and then that paper published in Science. It certainly struck a chord with the BBC, who approached the University in September to ask if they could collaborate on an episode of their popular programme All Over the Workplace. The show, which features two young people exploring a chosen career, focused upon marine biology, and having considered the full spectrum of the University’s expertise in the field, the producers asked if Richard’s plastics research could be a key topic. So Richard and two skippers of the University’s Falcon Spirit research vessel gave up a Saturday to take the youngsters and the film crew out on Plymouth Sound to collect water samples. They then returned to the Marine Station to film some testing in the labs. With new avenues of enquiry opening up all of the time, including the testing of entirely new product lines such as paints and sunscreens, Richard’s work with microplastics shows no signs of slowing down.